The National French Fried Shrimp Day is celebrated annually on December 21. It is a perfect excuse for all seafood lovers to treat themselves to a delicious dish. Shrimp is a favorite seafood in the United States. The easiest way to cook shrimp is to boil them. Other methods of preparing shrimp include sauteing, broiling, grilling, baking, and frying. Many people consider fried shrimp especially delicious. The National French Fried Shrimp Day focuses exactly on fried shrimp, namely deep fried shrimp. Deep frying refers to cooking food in a large amount of hot oil. It allows to cook food very quickly due to the high temperature of oil. 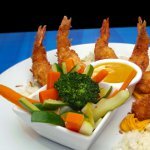 How to cook deep fried shrimp? First peel 1 1/2 pound shrimp. You need to remove the head and most of the shell leaving the last section of the shell on. Then cut the shrimp almost through lengthwise, remove the “sand vein” and wash the shrimp. Combine 2 beaten eggs and 1 tsp salt in a bowl. Then combine 1/2 cup dry bread crumbs and 1/2 cup flour in a plate. Place 1/2 cup oil in skillet and heat. Dip each shrimp in egg mixture, then roll in flour with bread crumbs, place in oil and cook until golden brown. Of course, deep fried food is not very healthy, but it is allowed to indulge yourself every now and then.